The line of trucks belongs to NATO forces in Afghanistan. The caption for the story tells two different tales. On the one hand, it notes that the trucks were attacked and set afire “hours after NATO forces killed several insurgents and captured a Taliban sub-commander.” On the other hand, it also notes that the trucks were burned “after hundreds of people blocked a main road and set them on fire to protest what they said were civilian deaths in Logar Province.” Whether those who set the trucks on fire were part of the “growing insurgency” or simply local Afghani citizens rising up in protest against unnecessary “citizen deaths” is not clear. And that, of course, is the problem. It is wholly possible that both tales are in some measure true, but even still the point has to be that a war fought in the name of capturing the “hearts and minds” of the people of Afghanistan seems slated for failure so long as we continue to kill Afghani citizens in the name of their own freedom and liberation. The photograph thus functions as an allegory of the frustrations of such an ill-conceived war as perceived from both sides: an intrusive formation of foreign, mobile vehicles stretching as far as the eye can see (to the limits of spatial and temporal infinity) and yet caught in a sea of flames that makes it permanently immobile. 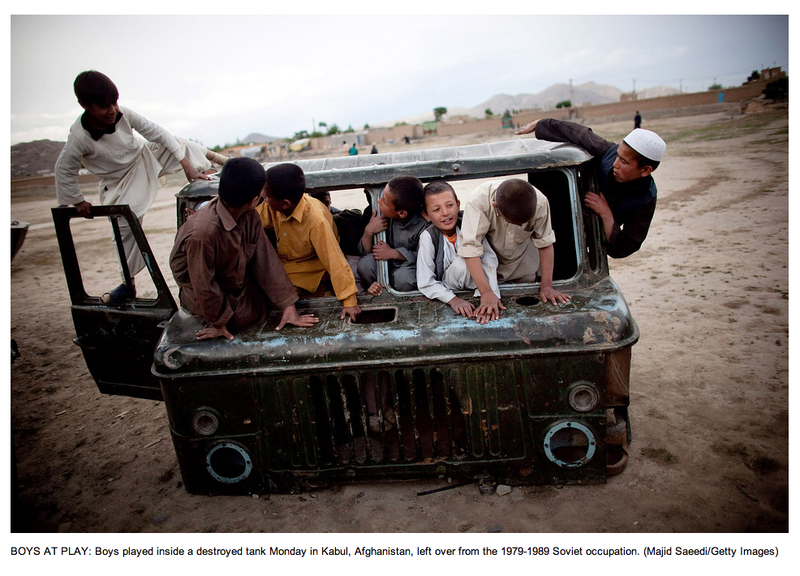 As with the rusted out refuse of previous attempts to colonize Afghanistan, the burned out trucks will no doubt sit in place for many years as visual monuments to the most recent such effort (and failure). The war in Vietnam was also fought primarily as a battle to capture the “hearts and minds” of a national people presumably at risk of being tyrannized by an oppressive political opposition. Enacted by turns as a fiasco and a catastrophe, the Vietnam War was by all accounts an abysmal failure. One might think that we would have learned our lesson—in George Santayana’s terms, “to remember the past” lest we be forced to “repeat it”—but that would seem not to be the case as the current war in Afghanistan, now the longest war in U.S. history, is being fought with little more than the same goal in mind. It should come as little surprise that we seem destined to a similar end. No wonder that the story this photograph shows has received so little attention.